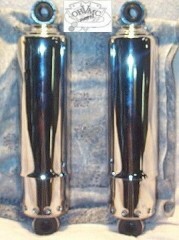 This set is 11” long with chrome full covers. Manufactured to fit 4-speed FL and FX frames 1973 – 86. 0500" inside diameter of shock mount bushings. Can also be used for lowering your later model bike as well setting up your custom new construction. When being used in custom applications ALL clearances must be checked...fender to chain/belt guard...fender to tire...tire to oil tank etc.